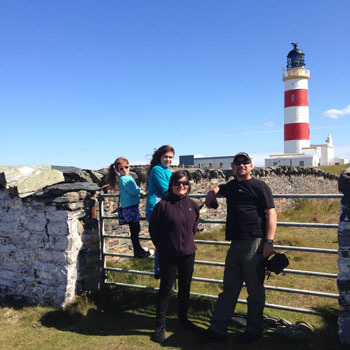 During 2015, the Isle of Man Government trained Dawn Repetto in the tourism and heritage teams, Robin Repetto in the Department of Infrastructure, and Clive Glass in the health service. After completing our training in Isle of Man and completing our work in the UK we had two weeks to spare before returning to Tristan. 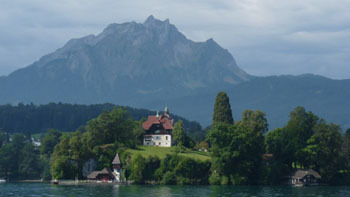 We thought instead of returning immediately to Tristan we would request permission to visit our family in Spain and Switzerland. We spent a few days in Spain with my Aunty Wendy and Uncle Martyn and a few days in Switzerland visiting Karen, Dani, Chiara and Alessia. 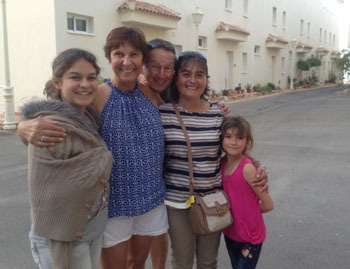 It was a wonderful experience meeting up with our family and seeing the different cultures in the different places. A great learning curve for the girls and I know they will never forget Sunny Spain and the Swiss Alps - what an opportunity! We are now in Cape Town and will return to Tristan on the SA Agulhas which should leave Cape Town on 3rd September. scheduled for Tuesday 8th September. Our time on the Isle of Man is drawing to a close and we just can’t believe how it has flown. 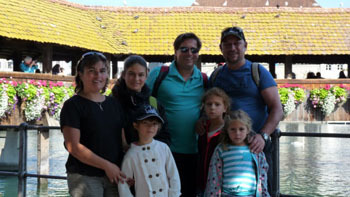 It has been a wonderful experience for myself and family and we will take many fond memories home with us. Jade attended St Ninians High School where she had the opportunity to study at IGCSE level. She made many friends and settled in quickly to school life even though the school was a lot bigger than on Tristan. 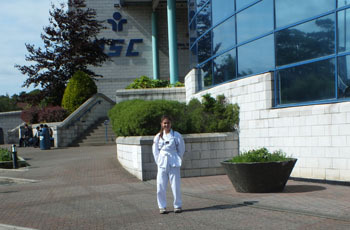 She undertook Taekwondo lessons in her spare time and found this experience very valuable. Amber attended Scoill Vallajeelt and thoroughly enjoyed her time making many friends in the process and attending many birthday parties. 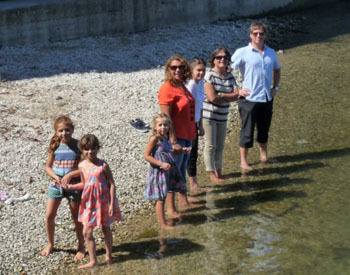 Her class, Year 2, had 28 children which is as many as the whole school on Tristan. 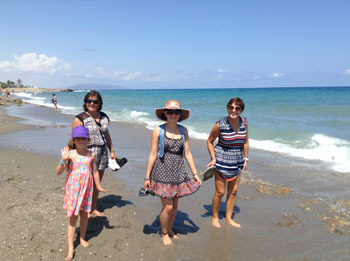 Both girls are now on the summer holidays and will only start school again on our return home. New literature ideas for brochures, leaflets etc. The experience for both of us has been very beneficial and we hope to go back to the island with new ideas and insight into how a different place operates. We would like to say a big thank you to those departments for taking us under their wing and helping us through this learning process, the people we have met along the way has been so kind and helpful. 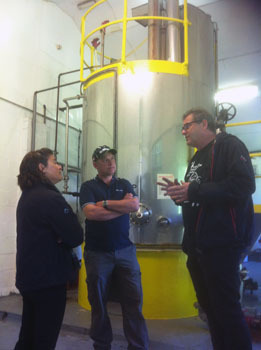 With thanks to Martin at Bushy’s Brewery, we had the chance to see how a Brewery operates and were able to be a part of the venture of brewing a Tristan beer with Bushy’s. We are ever grateful for this one in a lifetime chance and are thankful to Martin for his friendship and to all those who were involved, especially Curly the Brewer. We now look forward to the CAMRA Great British Beer Festival held at Olympia London, where our very special beer will be sampled and promoted. The Isle of Man is a wonderful place and I highly recommend a visit to everyone. The people are very benevolent and are never too busy to stop and help you find your way. Although the island is a lot bigger than Tristan you still get a very good sense of Island life. 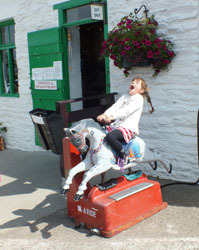 Apart from our training we also got to see some of the sites and festivals and managed to visit Curraghs Wildlife Park, a trip on the Steam Train, Laxey Wheel, Home of Rest for old Horses, Douglas Head, The TT road race, The CastleTown Bath races and these are only a few to mention. A big thank you, to the Governments of the Isle of Man and Tristan, for giving us this wonderful opportunity. Last but not least we would like to say a heartfelt thanks to our special friends Ken and Fran Rogers who has been so supportive to us while in the Isle of Man. Tristan and the Association are truly blessed to have them as friends and members. Our children look to them as their Isle of Man grandparents and we know they will be missed by us all, we will look back on our time together with fond memories. 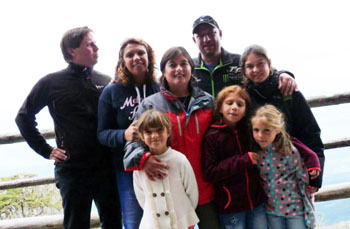 We hope one day to see them at Tristan where we can return their generosity. to return to Tristan in September, visiting England and South Africa en route. Dawn, Jade and Robin by the Andreas Village sign. 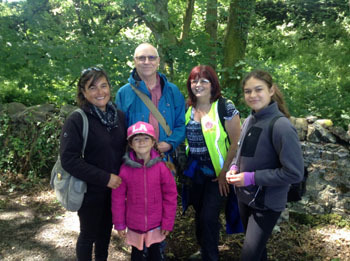 On Saturday 1st August Ken and Fran met up with Robin, Dawn.Jade and Amber at Ramsey Bus Station then took them to their home before having lunch at Milntown House and Gardens just outside Ramsey. 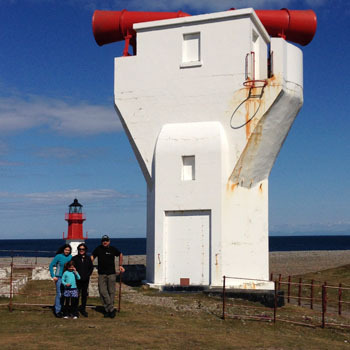 The group then visited the Point of Ayre,the most Northerly point in Isle of Man. Luckily it was not a foggy day so the Fog Horn did not go off! 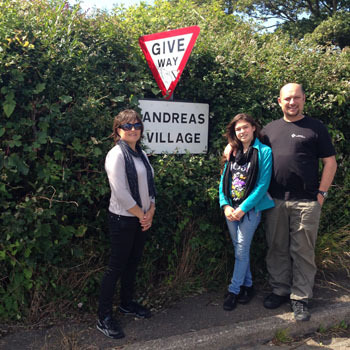 On way to Point of Ayre they went through the village of Andreas and stopped for photo shoot in memory of Andrea Repetto. Ken and Fran then took the family back to their home for some nibbles before returning to Douglas to drop the family off back at their flat, which they will be shortly leaving to start the return trip back to Tristan. Ken and Fran will be so sad to see them go, but feel so lucky to have had such good times with them, on the occasions they have meet up. 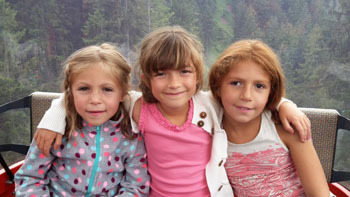 They intend to keep in touch with their new friends and hope to meet again in the future. 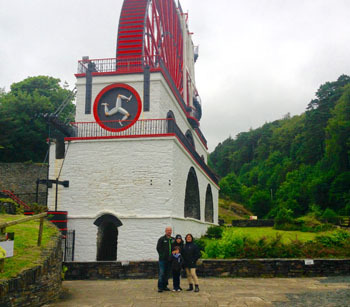 The Great Laxey Wheel - named Lady Isabella. Brooke in a wooded area of the Isle of Man on 19th July. 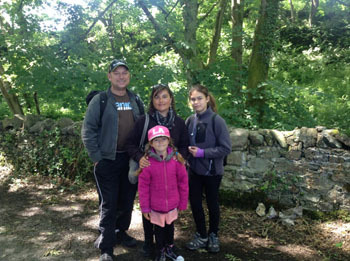 Dawn is very grateful to the kind couple who have offered assistance to Dawn who intends to set up a Geocache trail on Tristan when she arrives back later in the year. Photos show Robin, Dawn, Amber and Jade Repetto, right, and without Robin but with Alan and Angie Brooke in the photo left. 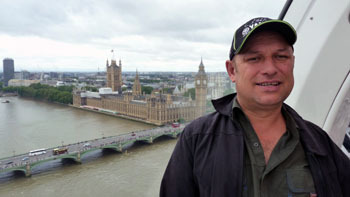 and had a ride on the London Eye. 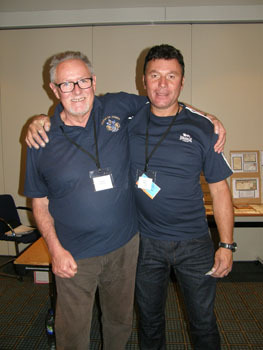 Robin travelled to Germany to carry out training regarding the Magnetic Observatory on Tristan. 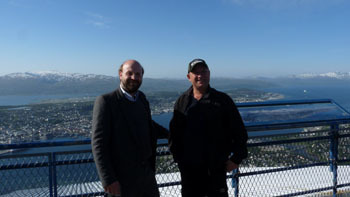 He spent a few days in Berlin and then went to Tromsø in Northern Norway to try and improve connectivity at the Observatory on Tristan. 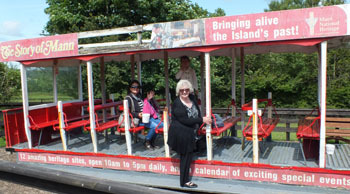 It was a wonderful experience which Robin thoroughly enjoyed. Both photographs above were taken on 10th July during Robin's visit to Norway. 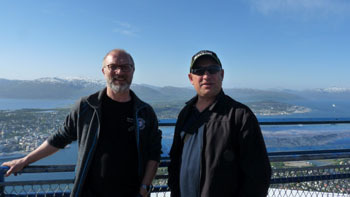 They were standing on an observation platform offering the stunning view over the city of Tromsø and the snow-capped mountains beyond. 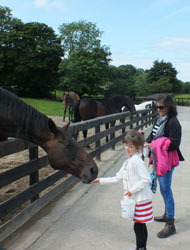 Ken and Fran Rogers met up with Dawn and Amber after lunch on Sunday and visited The Home of Rest for Old Horses just outside Douglas. Photos above and below show Amber with the horses and enjoying a horse ride. Dawn can be seen in two of the photos and Fran in the image below right. There have been no horses on Tristan da Cunha for nearly 200 years, but it is thought the British Army brought six horses when they took possession of the island in August 1816. Corporal William Glass had a role in utilising the horses and managing the troop of Hottentots who accompanied the garrison as part of the Royal Artillery Troop. 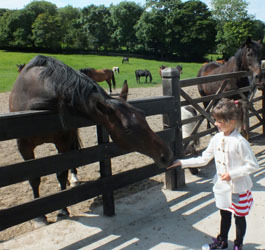 It is likely that the horses died out within 10 years. where she had been attending a Taekwondo lesson. 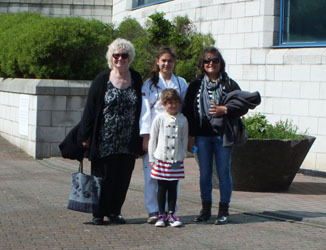 outside the Isle of Man National Sports Centre. who was coming back from his week in Germany. Ken adds that he and Fran feel so privileged to have got to be with such lovely people from Tristan, and long may it continue. 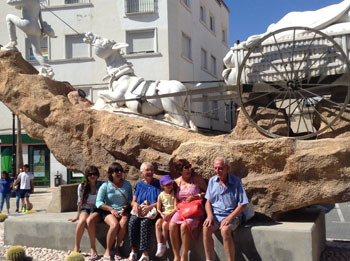 Tristan Association members Ken and Fran Rogers took the Repetto family out for the day on Sunday 28th June. They all had lunch at the Mount Murray Golf Club and then drove to The Sound, that over looks the Calf of Man. Fran, and behind Ken Rogers. 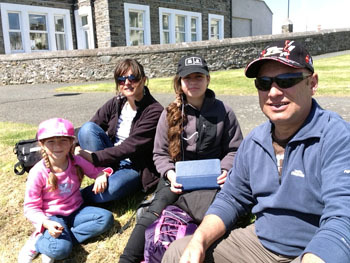 generous hosts to islanders on the IOM. 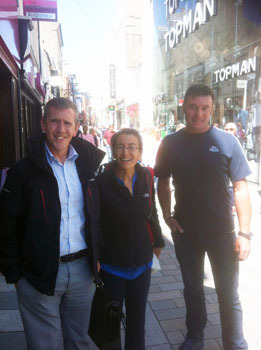 Administrator Alex Mitham, together with his wife Hasene and Tristan's UK Representative Chris Carnegy, paid a flying visit to the Isle of Man on June 10th and 11th - to visit Tristanians on attachment there, to thank their hosts, and to discuss the future of this fruitful inter-island link. The Manx government regularly welcomes Tristanians who want to gain new perspectives on how other islands work. In 2015, Dawn Repetto is on attachment to the tourism and heritage teams, Robin Repetto has joined their Department of Infrastructure and Clive Glass is with the health service. 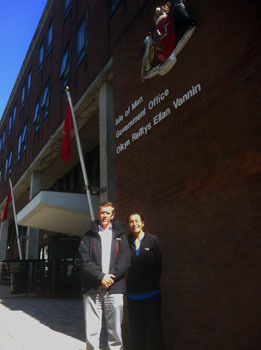 Alex held meetings with the Isle of Man's External Relations, Economic Development and Health and Social Care departments. 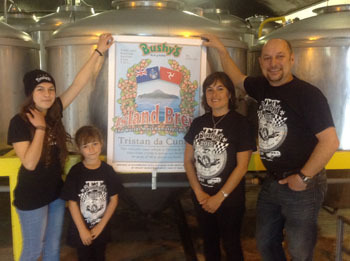 And there was time to visit Bushy's Brewery, which has taken delivery of a batch of Tristan berries as part of a plan to create a beer inspired by the remotest inhabited island on earth. 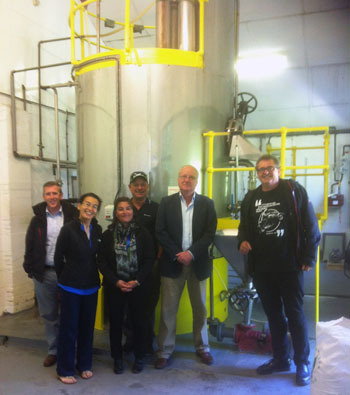 Right: Left to Right: Alex Mitham, Hasene Mitham, Dawn Repetto, Robin Repetto, Chris Carnegy and Martin Brunnschweiler in Bushy's Brewery. 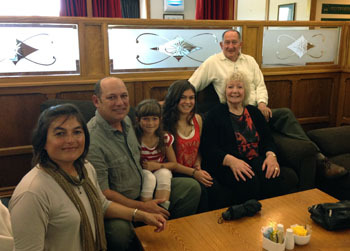 Dawn reports that the family are settling in well on the Isle of Man and really enjoying the experience. People are very kind and helpful and if you look a bit lost they will always stop and ask can they help with directions. 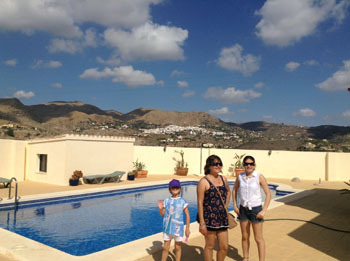 The girls have settled well into school with both girls are enjoying the experience and have made friends. Robin is working in Department of Infrastructure and is enjoying his time there. I am presently in Department of Economic Development and at the end of June will move to Manx National Heritage. 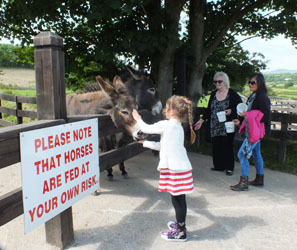 On the weekends we try and take time out to take the girls sightseeing, there is so much to see and do here. We are now experiencing the TT Festival and it is truly amazing. Robin and Jade are very big fans and those bikes move with such speed it's scary. Clive will also be attending some training at St John Ambulance, as well as search and rescue scenarios etc. Clive arrived on the Isle of Man on Saturday 7th March. 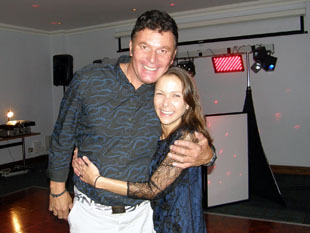 Annual Gathering on Saturday 11th April 2015.
and on the dance floor with Alison Hentley (above). See the 2015 Annual Gathering Page for more.